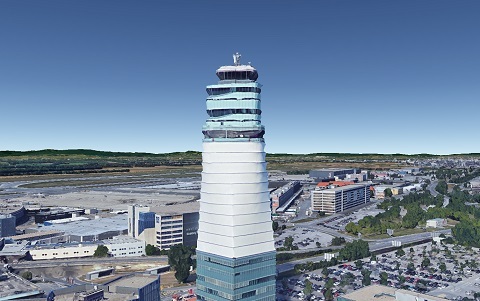 Vienna, Austria - The view from the tower in the direction of the runways is essential for air traffic controllers. Only when visibility to the free runway is sufficient, the times for airplane starts and landings can be optimized. Even for the evaluation of rolling traffic a clear view is important and cannot be replaced by radar screens completely. This is why an air traffic control tower is equipped with several features to improve vision for air traffic controllers. Tinted and slanted glass helps to improve contrast at different weather conditions. Blinds (not unlike the ones in a car) and shutters allow to avoid glaring and improve light conditions. However, when reflections are coming from a direction where another object should be recognized, a dazzling of the eye cannot be avoided. This can lead to after-images on the retina, which impede following visual tasks. Dazzling of longer duration can also lead to headaches and in the extreme case to retinal burn. The large number of commercial buildings at Vienna Airport use a lot of electricity and since they should be operated sustainably, the airport operator has decided to construct multiple photovoltaic plants on top of the otherwise unused roofs of hangars and office buildings, which will be installed in the coming years bit by bit. Particularly new buildings will be constructed with PV installations from the very beginning using their generated electricity inside the building from day one. The large roofs of hangars and other commercial buildings with flat roofs provide ideal conditions for the operation of solar plants. Since there are only a few structures on the roofs, there is little threat of local shadings on the solar panels. The large size of the roofs of hangars and other commercial buildings at the airport with very few space restrictions allow especially cost-effective large scale commercial installations as well as the optimal orientation of the PV panels. The surface of PV panels consists of glass, which reflects part of the sunlight. Even though the reflected part is only a small portion of the total irradiation, it is still strong enough to cause a dazzling hazard. In order to assess this glare hazard at the air traffic control tower as well as at airplane traffic routes, Zehndorfer Engineering has been involved already in the planning phase of the PV plant. The measurements of the installations, based on engineering drawings already available, were used to visualize the plant in a 3D model. As it turned out, even the small slanting of the flat roofs in a range of 2° played an important role. At a PV elevation angle, originally with a slope of 10°, this additional small slanting caused significant differences in the orientation of the PV panels in 3D space. The first simulation of reflections was performed with a PV mounting structure in south direction. The points of immission had been chosen in the approach sections of the runways as well as on the air traffic tower. The calculation of the reflections of the sun over the astronomically possible sun hours, turned out to hit the tower at certain days of the year from 4pm to 6pm. This calculated duration of the glare was quite long and considering the important visual task (to recognize airplanes on the runway as well as the taxiways) it was not negligible. The PV plant, when looked at from the tower, will lie directly in the direction of the runway and will be visible from the top as a large area. A glaring from this direction would have posed an unbearable threat to the operation of the air traffic tower, which had to be avoided. In order to reduce the glint and glare towards the tower and at the same time not increase reflections towards airplane routes, several versions of the PV panel orientation had to be simulated. Finally, a panel orientation was found that completely avoided reflections towards the tower with only minimal reductions of PV generation. 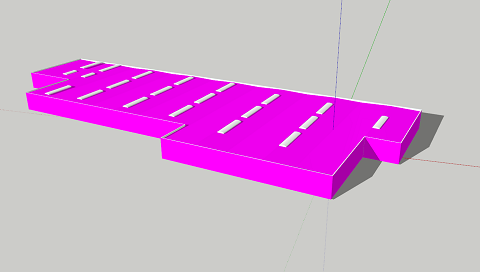 The engineers of the PV plant were able to adapt the mounting structure to the elevation and azimuth angles simulated. The construction of the original plant layout would have lead to complaints by air traffic controllers and consequently the disassembly of the plant. At other locations, such as the Manchester-Boston Airport in US state of Vermont this is exactly what happened (Video) and the whole plant had to be re-constructed, causing enormous costs. Luckily today we have improved assessment methods and simulation software available in order to recognize glint and glare at an early planning stage. The simulation also allows to suggest glare-reducing measures and verify their effectiveness. 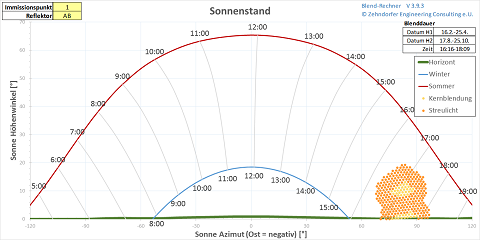 Zehndorfer Engineering frequently calculates Solar Glare Assessments for Solar Plants and Glass Facades.